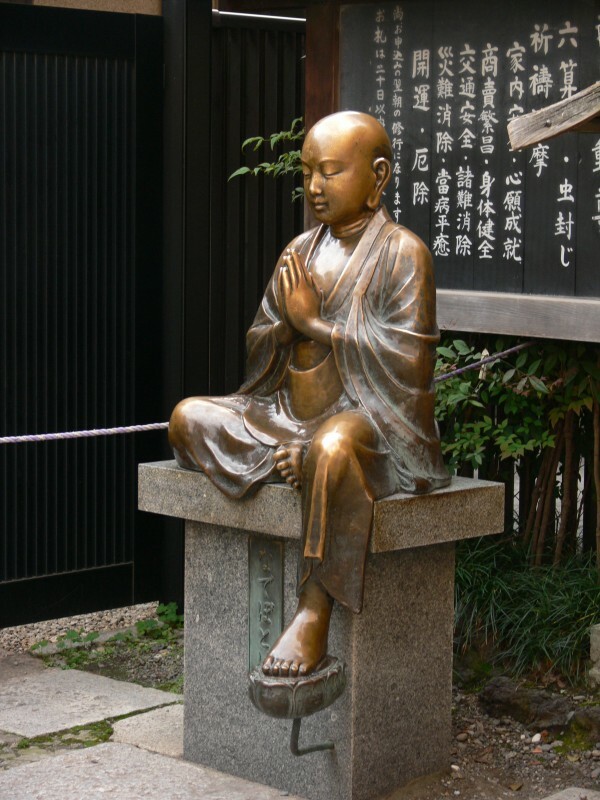 Binzuru (Pinzuru) is one of the 16 arhats of Buddhism. His statue is usually outside beside the temple and people come to rub a part of it to heal the aching part of their own body. 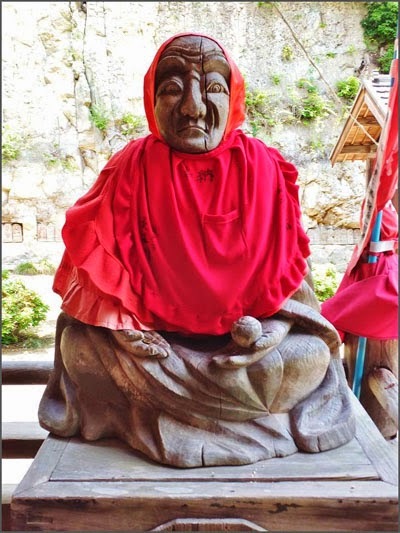 This type of statue is called "rubbing Buddha statue", nadebotoke　(see below). This special ceremony occurs on the sixth of January, one day before the "Seven Herbs" ceremony. 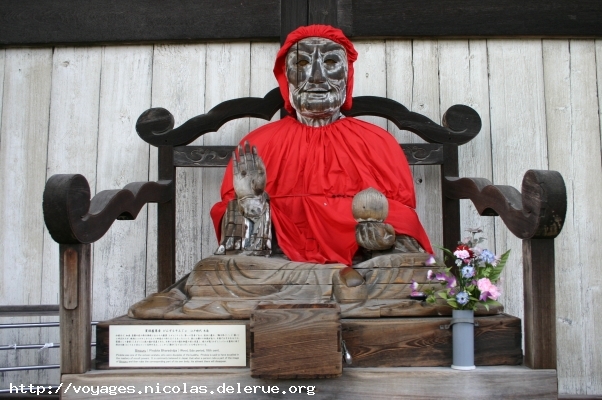 On this day at the temple Zenkoo-Ji 善光寺 in Nagano, the statue of Binzuru is dressed with a straw rope around his head. 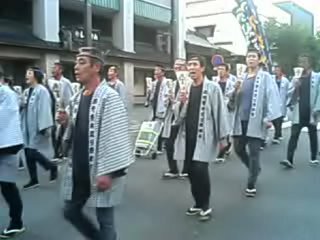 While the believers touch him with bamboo ladles (shamoji 杓), he is carried around the outer shrine and then back to his original place. People pray for health and good luck for the coming year. Also called Binzuru (J). Pindola Bharadraja (Skt). West; resides with 1,000 disciples in Saikudani-shi (Skt. 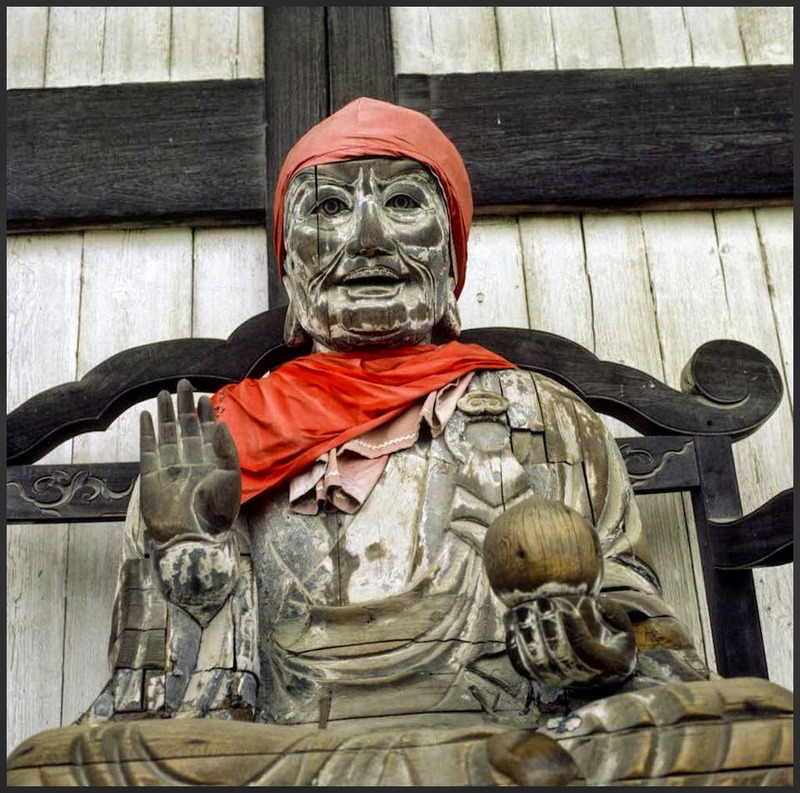 Aparagodani); the most widely revered of the Arhats in Japan; all the others are less known to Japanese lay worshippers, and they rarely serve as the central objects of devotion. Pindola, however, according to the Flammarion Iconographic Guide on Buddhism, is the Arhat par excellence in Japan, and is mainly worshipped by lay people. Quote: "In Japan, Pindola is represented as an old man seated on a high-backed chair, with white hair and bushy eyebrows. Statues of him, in painted wood or stone, are usually well worn, since the faithful follow the custom of rubbing a part of the effigy corresponding to the sick parts of their bodies, as he is reputed to have the gift of healing. He is also very frequently offered red and white bibs and children's caps to watch over the health of babies, so that his statue is often decked in rags. He is represented in painting as an old man seated on a rock, holding in his hand a sort of sceptre (Japanese shaku), or a sutra box and a feather fan. All the other Arahants are usually worshipped in Japan in his person. In some cases, his efficgy is placed in monastery refectories, as at the Jikido (Shakudo) in Todai-ji Temple (Nara), and in Hieizan." Dance with Us at the Binzuru Festival! 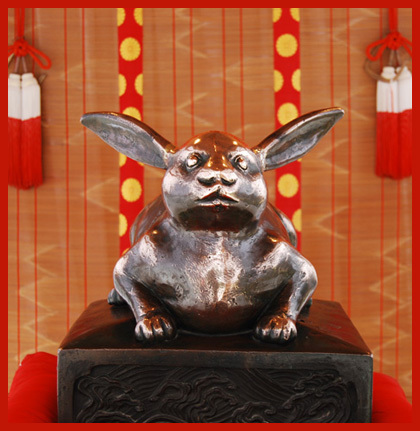 Click HERE to see some more of the famous Binzuru statues. Binzuru, O-Binzuru sama, is the most famous of them all. His statues are in front of many temples. Usually we have a statue of Binzuru-sama ビンズルさま　as a healer to touch. 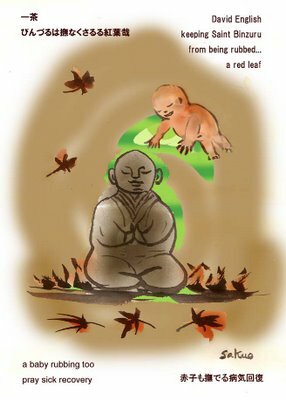 You rub him on the spot where your own body hurts, but here our Daruma takes the part of the healer. If you touch the part that hurts you, you will be healed. 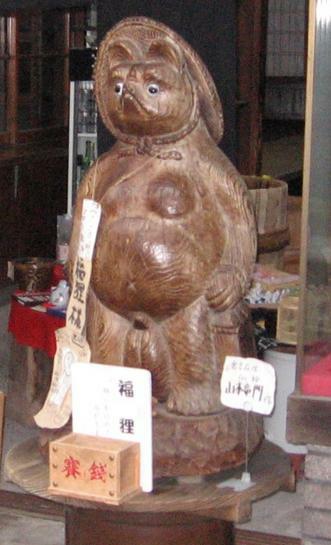 Here is a badger to be rubbed for good luck, fukutanuki　福狸. We found him in front of a ricewine store in Kurayoshi, 2006. His breast was quite worn out, he/she must be a helper for mothers with small babies. Once I visited a small temple way back in the North of Japan. 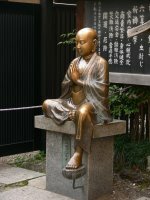 The touching Buddha was a Kannon Bosatsu in a female incarnation, with rather large breasts. She was seated on a lotus throne on a high podest. Mothers would come to her to touch the breast and pray for milk while breastfeeding. The statue was so high up, many mothers could not reach the breasts at all. So it was customary in this temple to touch one of her knees instead. And believe me, the knees where all worn out and shiny! Click HERE to see a few more of these touching healers ! 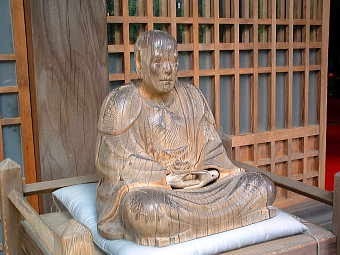 Binzuru is the wooden statue at Zenko-ji temple . The divine grace is to cure illness, and its annual ceremony is held on January sixth. 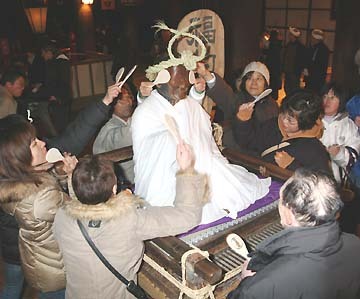 People hit its head by rice spoons with their familiarity to Binzuru to thank for its works for them for a year. Here, a tree's budding branch (ki no me) is doing the lucky rubbing. In this comic haiku, an autumn leaf has fallen onto the statue's holy head. 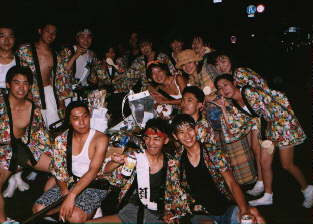 Sakuo Nakamura notes that Binzuru-sama is famous for his bald head, which people rub in hopes of recovering from sickness. Here, a leaf is doing the rubbing, "like a baby's palm." Yoshida Miwako sheds further light on this haiku: in a dark temple, votive lamps darken Binzuru's image with soot, but his glass eyes still glitter. It's a pitiful feeling, Yoshida adds, the glittering eyes in the gloom. On this gray winter day, the first big snow of the year twinkles like Binzuru's eyes. See Issa burai (Nagano: Shinano Mainichi Shimbunsha, 1996) 186. In the haiku, a butterfly also strokes the saint for good health.
. Binzuru sama ema 絵馬　. Einer von Shakyamunis Jüngern. Der Erste der 16 Arhats, der erste mit übernatürlichen Kräften. In Japan bald als Gottheit verehrt, die körperliche Leiden und Gebrechen heilt. Daher finden sich seine Statuen oft in den Vorhallen der Tempel, so daß die Gläubigen darum herum laufen können und dabei diejenigen Stellen der Statue berühren, die an ihrem eigenen Körper erkrankt sind. Die Statuen sind entsprechend blank und abgerieben. Besonders bei Holzfiguren sind die Augen und die Nase fast ganz abgerieben. Oft auch im Refektorium eines Klosters aufgestellt. Sitzende Figur eines alten Mönchs mit kahlem Kopf, der Oberkörper nackt mit sichtbaren Rippenknochen, mit einem Tuch über den Schultern. Häufig aus Metall gefertigt. The two adjacent shrines are both extremely old. 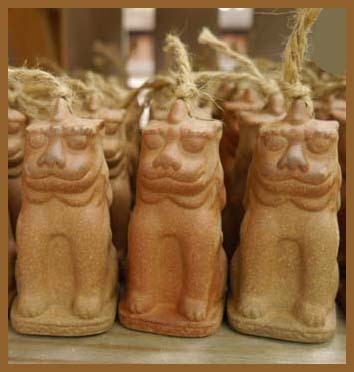 Fukagawa Shrine is believed to be around 1,200 years old, dating back to the Nara Period of Japanese history, and the shrine's treasure house, has a pair of guardian dogs, komainu, made by the legendary potter Toshiro Kato, the founder of Seto's ceramic industry. is covered with glazed, green, ceramic tiles called oribeyaki. Look out for the replica statue of a dog in the shrine's grounds near the main hall. Legend has it that during a dream a dog told Toshiro where to dig to find the high quality clay he was searching for. 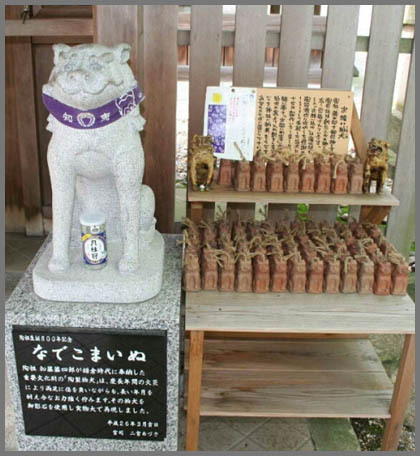 As a sign of thanks Toshiro crafted an image of a guardian dog (komainu) for the shrine. The originals are kept in the treasure house (see below for hours and admission fee). 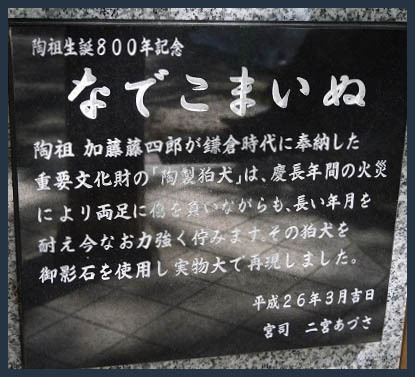 next door, enshrines the spirit of master potter Toshiro Kato, who was active here in Seto in the 13th century. for your adding my haiga to your blog referring to Binzuru. There are many interesting things featured at the blog. In the compound is a small statue with a very shiny red face. 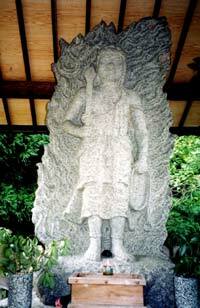 It is a statue of Binzuru, one of the first sixteen disciples of the Buddha. He was a physician and came from a family of distinguished physicians.